Tolls on the Severn Bridge have been cut by almost a fifth as the crossings return to public ownership. 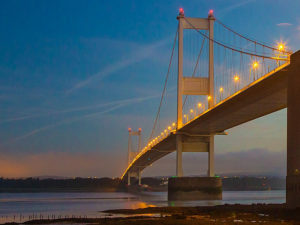 The move sees Highways England assume responsibility for the bridges’ operation and management from Severn River Crossing Plc, with VAT now removed on tolls. This reduces the charge to £5.60 from £6.70 for car drivers, £11.20 from £13.40 for van operators up to 3.5t and £16.70 from £20.00 for Large Goods Vehicles – and means fleets no longer need to claim back VAT. Tag prices will also reduce, with the new prices set at £98.56 for cars, £197.12 for LCVs and £330.66 – this compares to £117.92, £235.84 and £396.00 previously. The switch back to public ownership follows the repayment of the cost of building, finance and operations with the Government also having previously committed to removing the tolls altogether by the end of the year in a move labelled by Secretary of State for Wales Alun Cairns as “the biggest economic stimulus for South Wales and the Valleys for decades”. The Freight Transport Association (FTA) greeted the toll reduction as a “welcome boost to logistics businesses in both the South West and South Wales already facing serious financial pressures” but added “the reduction by the rate of VAT has little impact on the business community which, in many cases, can reclaim this cost”.